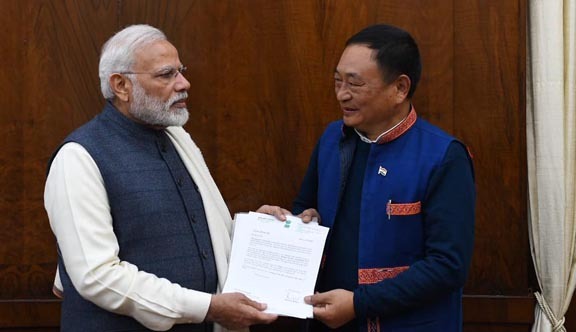 Former Union minister and Arunachal East MP Ninong Ering called on Prime Minister Narendra Modi in the national capital on Wednesday with a request to withdraw the Citizenship Bill. Senior Congress leader Ninong Ering also apprised Pime Minister Modi about the critical situation of Siang river and submitted a detailed research report on formalization of national policy of silt management. The Citizenship Bill, passed in the Lok Sabha on January 8, 2019, seeks to amend the Citizenship Act, 1955 for providing Indian citizenship to illegal migrants, from Afghanistan, Bangladesh and Pakistan, who are of Hindu, Sikh, Buddhist, Jain, Parsi or Christian extraction. However, the Bill is yet to get nod of the Rajya Sabha where the BJP-led NDA has not majority. It may be mentioned that the All India Congress Committee (AICC) has decided to issue a three-line whip to its members of Rajya Sabha to vote against the Citizenship Bill. This was revealed by party general secretary in-charge for Assam Harish Rawat recently. Talking to reporters after separate meetings with Congress president Rahul Gandhi and Leader of Opposition in Rajya Sabha Ghulam Nabi Azad, Rawat had said the party is always concerned about Assam and the northeastern region and it would continue to do so. “As per the directive of the Congress president, the party will issue a three-line whip to its members of Rajya Sabha to vote against the bill,” Rawat had said, adding it will try to rope in like-minded parties for support against the Bill. The Arunachal MP recently urged the legislatures of the Northeast to stand united against the Citizenship Bill for survival of the region.